One of our daily events on my Mom and my recent trip to LA was the Getty Museum. This project was funded by the Getty Foundation, and has been open since the late 90s. They purchased about 750 acres and perched this billion dollar facility on a hilltop with great views of LA and the ocean. But the dedicating principle of this place is the preservation and display of great art. We spent part of the day there and left just amazed at the quality and quantity of the displays, and its accommodating design for the public’s use. I am unabashedly prejudiced, but I think my son is a gifted artist. He quickly masters the basic techniques of the many genres he tries, and shows what I consider to be great creativity in the things he creates. One creation of his dates back to his days in college. He took a pottery class and did a couple of pieces that I really liked. On a visit back home while I was on this trip with my Mom to LA, he decided he no longer wanted one of the pieces we’ve been keeping since that time; a piece I’ve always liked. We decided to donate it along with some other things to our local Goodwill store. As I was carrying it from the house to the garage, an accident caused the storm door to close and bump into the piece, breaking part of it off. 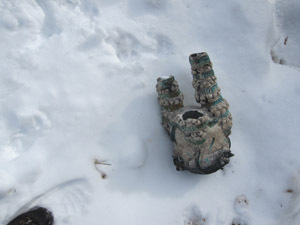 I decided at that point that I would not be taking a broken piece to Goodwill, so I carried it out to the place on our property where I dump things like ashes from our woodstove, and tossed it down the hillside. As I drove to town, I became more and more comfortable with my decision. It is no longer inside, which satisfies Steve’s decision to dispose of it, and it is now living in a place on the hillside where I’ll be able to visit it sometimes. As the years go by, it will undoubtably fracture due to freezing and thawing, become covered with moss and lichen, and gradually revert to the clay it came from. And if I choose, I can watch the process. While not exactly the Getty, my new gallery is a fitting home for this piece of art. This entry was posted on Wednesday, February 16th, 2011 at 5:24 pm and is filed under Uncategorized. You can follow any responses to this entry through the RSS 2.0 feed. You can leave a response, or trackback from your own site. 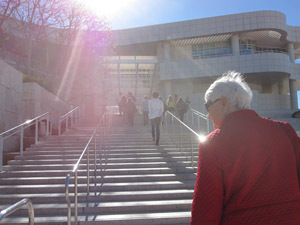 When living in Santa Barbara we visited Getty during one of our outings to LA. We also loved it and were impressed by the art involved in every little detail of that place. Now about your son’s art… and without judging his talent (since I don’t know Steve that well) I can tell you that your words make me feel better about my decisions about how to “recycle” or “relocate” and eventually get rid of some of our kids art. Art that as you might remember, at the age of 4 comes in truck loads from school.